Philip Dalling pays tribute to the former Leicester, Long Eaton, Sheffield, Newcastle and Nelson rider who died earlier this year at the age of 81. Dudley Jones looks back 44 years to the famous night when Norwich Stars took on the might of Soviet Russia. Thanks to Reg Fearman for digging these pictures of the famous Swedish track out of his collection. Jim Blanchard has painted this magnificent picture of David McAllan that will be auctioned for David's benefit. Full details on David's Website. "We have had an early indication that the main UK newspaper library which is at Colindale in north London is to close in the next few years. This will mean a serious disruption to the availablilty of newspapers and all the speedway magazines the library holds for a considerable period of time. If anyone needs to do some primary research from newspapers they can only read at Colindale they had better get their skates on NOW. Please get in touch with Nigel Bird at nbird123@aol.com if you want any further information." 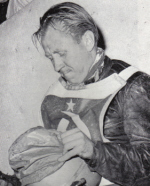 Steve Wilkes is looking for heat details from some meetings staged at Nelson in 1967 - Can You Help? "What fantastic memories, almost mirrors my early years as a Stoke Potters fan. Saturday nights were so special and I can feel the atmosphere even to this day some 47 years later. Nothing has ever come close to the excitement of watching your heroes in action. I was watching the Potters at Sun Street Hanley from 1960-63 until they closed, we've still got speedway in the city, but it will never be the same. Up the Potters!" "I have achieved the proverbial needle in the haystack through your column. Yes I found someone who was at West Ham the night Harry Eyer crashed in July 1953 and he filled me in with the true version of what happened that fateful night. He said he was standing right where the crash happened. He was 13 years old at the time and he had been supporting West Ham since 1940. I would like to say a special thank you to Speedway Plus for inserting my request in your website." 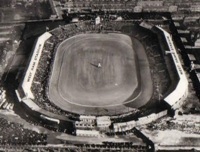 Next Monday marks the 80th Anniversary of the first ever meeting at Custom House stadium. Hammers' fan Robert J. Rogers decided to dig into the newspaper archives to see how the local press covered the event. This article is the Stratford Express' report of that first night of racing. New contributor Andy Gallon identifies some of the reasons why he and others are keeping their hard-earned cash in their pockets rather than handing it over at the turnstyles. Journalist Chris Seaward visited this West Australian circuit on his working holiday last winter. Team-GB may have reason to be thankful to this track in the years ahead as it's where Tai Woffinden cut his teeth. AllSpeedway.tv is a relatively new site that allows speedway fans to watch and upload videos, kind of like a cut-down version of youtube that's exclusively for speedway vids. It's still early days but there are already some interesting clips on there. James Chalkley is looking for West Ham programmes from 1953 - Can You Help? Jeff Scott from Methanol Press will be selling his wares at Redcar, Edinburgh, Workington and Newcastle over the next few days. "Awesome site!! We get a bit starved for info in West Aussie. This site is a major help for info and navigating the web looking for speedway stuff. " "I remember Alan well from his time in Britain, always seemed to have a lot of natural talent but didn't always get the points he should have." Long Eaton riders and fans staged their first ever reunion night last month. Legends Ray Wilson, Dave Perks and Norman Hunter were all present. Simon Stanley reports on what seems to have been a most enjoyable evening. Tracy Holmes looks back on the career of the Kiwi who rode for Glasgow, Sheffield, Newcastle and others during the eighties. Doug McFarlane recently visited this very impressive Polish track for the Edward Jancarz memorial meeting. Barry Dalton is still hoping to complete his Peterborough programme collection - Can You Help? "I enjoyed reading your Santry speedway article. It brought back a lot of good memories for me as I was a novice rider when Mike Tams was there. Ginger O'Brien, Mike Savage and Don Perry were all friends of mine. They were exciting times for me and just great to look back on." "The Southampton Pits 1961 pictures, great, more similar please, the web site in general - again, great, something for speedway enthusiasts of all generations." We'd be delighted to hear from anyone with old speedway snapshots they'd like to share. An exclusive extract from Jeff Scott's latest book. This chapter covers his visit to the North-East derby at Brough Park last August, the night on which he met up once again with the man who introduced him to speedway and to whom this book is dedicated. Also, if you've ever wondered who writes the programme reviews in the winter editions of Speedway Star then read on. We apologise in advance for any errors in the 'page paragraphing'. Our verdict on the fifth book in Jeff's speedway 'trilogy'. This latest volume covers his travels in the 2007 season. Charles McKay brings us pictures of the home of the famous Vargarna Wolves. 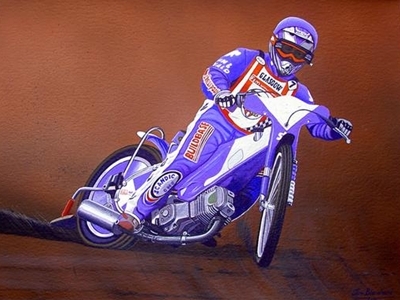 Birmingham fan Elaine Harris has some very impressive speedway artwork for sale - check out her website to see examples of her work. Robert J. Rogers has contributed some speedway articles to the Newham local history website. Click here to read his 'Requiem for a Speedway Team'. Monday marks the 38th anniversary of the Lokeren disaster. "I too remember nights at the Stanley track. Probably a little earlier. I think I lost serious interest in speedway prior to the disbandment of the 'Chads'. However I do remember Reg Duval, Brian Craven (Peter's elder brother) and my favourite G.Newton, not for his outstanding results but for the excitement he created with his style of riding. He was one of a dying breed of leg trailers." "This stadium was used in the film 'Once a Jolly Swagman' starring Dirk Bogarte and Bill Owen !!" These pictures are actually screen captures from the film. John Hyam makes a welcome return to the site by sharing his memories of Keith Harvey. The South African rode in the UK before and after the war, most notably for New Cross - in whose colours he's pictured here. Track pix returns this week after being squeezed out by everything we had going on last time. 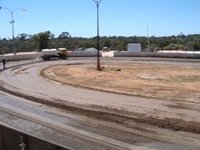 These photographs are of the Gatton Showground circuit which is around an hour's drive from Brisbane. The photographer was our old friend 'Handy Andy' Davidson. Andy Higgs has contributed these photographs from Monday's big meeting at Monmore Green. 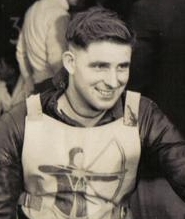 Poole supporter Trevor Hunter is hoping to produce a book covering every rider to have worn the skull and crossbones. He's struggling to find portrait photographs of a number of them - Can You Help?
" Jimmy McMillan, George Hunter, Oyvind Berg, Doug Willie Templeton, Bobby Beaton, Reidar Eide, Bert Harkins, amongst so many others who were a privilege to watch racing in and around Glasgow, Edinburgh and Coatbridge. Jimmy McMillan was without doubt one of the outstanding talents of the 70's, and it is indeed a shame that a World Championship Title was not forthcoming. I saw so many fine races where he fully demonstrated his undoubted talent to the full with passing manoeuvres that would be all but impossible with to-days dirtless tracks and over powerful bikes. Having now lived overseas for many years I must admit that unfortunately I have lost touch with regular speedway over the years, and that the modern version seen during the occasional visit to the UK, whilst still occasionally very entertaining, does not provide the same level of enjoyment that the sport used to present as an overall spectacle. Passing is at a premium, and in keeping with other sports, the riders in general are basically nondescript nice boys. There is really no one to stir up the crowds emotions. How many can remember the scenes of Reidar Eide dominating a race so completely that he could slow down, waving his opponents to catch up with him and then roar off into the distance once again after they had caught up? This event happened involving the Sheffield rider Arnold Haley, during either the Scottish Open or some other individual meeting at Hampden Park. The crown baying for blood as Reidar did the Bad Boy routine, with the crowd eventually erupting as the referee disqualified the Norwegian for un-gentlemanly conduct. Good times indeed for a sport that is still a pleasure to watch even though the racing quality is not perhaps what it could be. Thanks to Jimmy, and to all the others from the period who provided so much to the sport as a whole, and much enjoyment to me on a personal note."